and .45 ACP using clips. This one sounds like that. But could be misrepresented. I've seen Model 25's that had 2 cylinders, one for ACP and one for Colt. Never one cylinder that accepts both calibers. The reason I ask is I picked up 25-2 .45acp that has the Chambers cut for .45 Colt. Guess the only way to know if it works is to try it with ACP and clips. 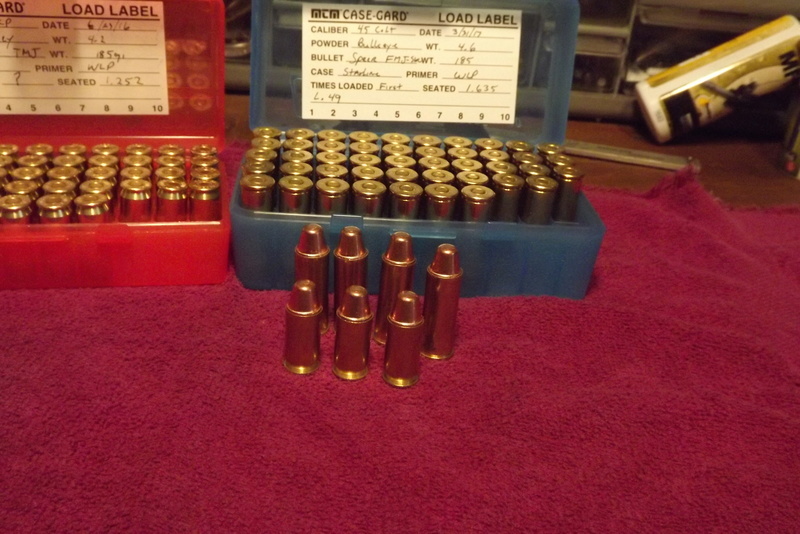 Has .037 clearance to recoil shield with .45 Colt, .002 with ACP and clips. Maybe it was setup for 45 Colt in moon clips? Are all 25-2's set up for moon clips or are some that don't need them? To the best of my knowledge, the 25-2 std was the short cylinder with a .45ACP chamber that allowed 45ACP to be fired without clips by seating on the case mouth. Might have your answer here James. Apparently there is some demand for that modification. They even make moon clips for your 45 colt that are thin enough to work. They are cutting down a 25-5 to accept .45 acp and use the 45 colt but results would be the same except you can use the thicker .040 moons with yours. Len, the clips work fine, the cylinder shouldn't be cut for 45 Colt. Plus, it shoots like a dog. I have been looking for a cylinder that has not been screwed up. Found one in stainless. Yea, I know. And then there is this solution. Adding new meaning to the term Long line and short line. Hmmmm... I can't​ go over 1.6 though. I loaded those for the cannon and length was not even a consideration. If you used the moon clips made for the colt and seated a tiny bit deeper these would work. Too bad were 2500 miles apart. We could test some loads. I have a lot of different loads for the Colt. Some would test the integrity of the pistol and some are powder puff for Bullseye. Just to clarify. No moon clips needed for Colt. Needed for ACP. Just to clarify. They do make moon clips for the Colt. They are thinner and would position the bullet correctly. They are needed when you use a 45acp cylinder for 45 colt (too much gap). Just trying to help James. Sorry if TMI.